City Attorney Mike Feuer was among the lineup of leaders from throughout the county to urge the local community to work with his office, police and sheriff’s officials to end gun violence at a rally in South L.A. on July 13, hosted by state Assemblyman Mike Gipson (D-Carson). Tevin Price, 19, was killed by a gunman in front of his mother earlier this year outside a South L.A. market after refusing to give up his red shoes. 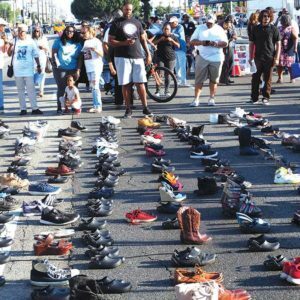 Local residents in attendance left pairs of shoes at the intersection of Vermont and Manchester avenues to represent their friends and family members who were killed by guns.